The system of cities and urban nodes in the Baltic Sea Region is very articulated and dense in its southern parts, with a network of regional, main and major cities of different size in Germany and Poland, while in its Northern and Eastern parts the city system is very scarce with only few nodes of comparable small size. However, even though smaller in size the regional cities in the North serve large local and regional service areas with goods and functions, while in Germany or Poland the dense city networks established a well functioning division of work where each city offers a different set of (decision) functions, facilities and opportunities. 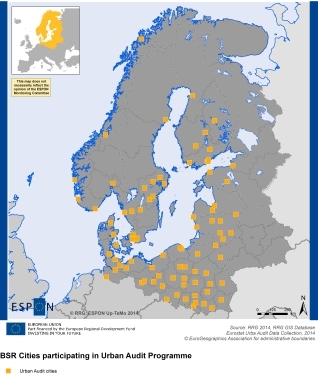 Only few city areas in the Baltic Sea Region are considered as metropolitan regions of European or global importance. Besides capital city regions, cities such as Sankt Petersburg, Bergen, Gothenburg, Malmö, Hamburg, Bremen, Szczecin, Poznan, Lodz, Wroclaw, Katowice and Krakow can be considered as gateways to markets and people. These cities are considered as drivers of economic and demographic development in the BSR. 84 of these cities participate in the Urban Audit programme on urban data collection to measure and improve the quality of life in European cities. 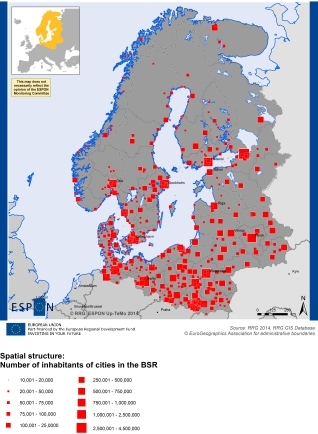 Within the BSR, the majority of these cities are Polish cities (29), followed by Swedish (13), German (10, only BSR territory), Finnish (9) and Lithuanian and Norwegian (6 each) cities. For the remaining BSR countries, Latvia and Denmark have each four cities participating in Urban Audit, and Estonia three. Belarus and Russia are not participating in Urban Audit.